5D/4N Experience Siberut Island: Native Living with Mentawai Tribe Embark on the one-of-a-kind journey with us and experience the indigenous life of Mentawai Tribe. Isolated from modern civilization, this trip features a challenging trek off-the-beaten path and fairly basic living arrangement – suitable for the adventurous and carefree soul. 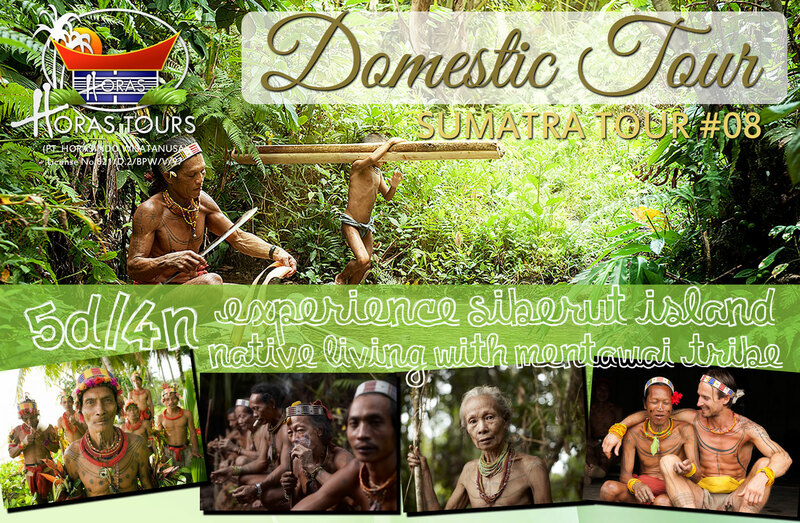 Expect the inspiring adventure of living the unadorned simple life of Mentawaians in the heart of the Siberut Jungle! Day 1 : Arrival & En Route to Muara Siberut Upon arrival at the airport, our guide will welcome and transfer you to Padang to proceed with ferry ride to Muara Siberut. We will overnight at the ferry, arriving to Muara Siberut early morning of the next day. Day 2: Muara Siberut - Departure to Mentawai Clan Village Prepare yourself for a long yet rewarding journey to reach the Mentawai Clan Village. Upon arrival at Muara Siberut, gear up for the next transfer using speedboat. We will arrive at the trekking destination around noon. Taking the easier and more scenic path, get ready for a 4-6 hours trek through the muddy path to the depth of Siberut Jungle. Day 3: Stay at Mentawai Clan at the Village There’s nothing like learning a culture by living them yourself. Today, you will have a full-on experience of practicing the way of life of Mentawai people. Wake up for a bath in the river and enjoy the simple Indonesian breakfast of bread, jam, sago, and eggs. You will proceed to join their daily activities of fishing, sago processing, bark cloth processing, manufacturing a bow and arrows, and concocting poison for the arrows. You are also free to visit other clans in the area or explore the pristine jungle at leisure. Day 4: Village - Muara Siberut - Padang Today, we will have a full-day journey back to Padang. After breakfast, prepare to hike back and proceed for speedboat ride to Muara Siberut. Transfer to Padang with ferry, and overnight at the ferry. Day 5: Padang Transfer Out We will arrive at Padang in the morning and our guide will transfer you to hotel or airport for your next destination. We trust you had an inspiring trip and sincerely hope to see you again on your next trip! Please enquire with us with your travel needs to get comprehensive price for Sumatra 8 tour package. Feel free to contact us for special tour arrangement. Meet us at ITB Berlin 7-11 March, 2018! Hall 26-A, Stand INDONESIA, table 41. See you there!